Your body language can really affect how you portray yourself to the world. 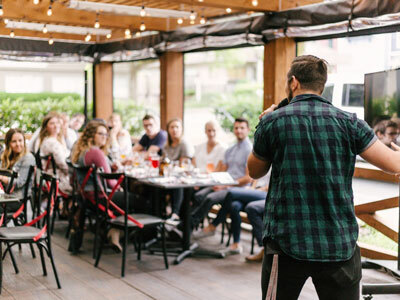 Speaking in public can make anyone nervous, but the secret is not to let anyone see you sweat up there. Rachel Kelly, author of WALKING ON SUNSHINE, explains how you can appear more confident. Just the thought of speaking in public used to make me feel as if my pounding heart was about to break out of my rib cage. But I can’t avoid giving a short speech in a few weeks, so I recently went to a talk given by a life coach, and it left me marveling once again at the close links between body and mind. I learned that different ways of standing or sitting can affect your hormones and nerves. So when speaking, you should stand with your “head up, arms thrown wide open, and taking up as much space as possible.” Our coach explained that standing in this so-called “power position” not only makes you look calmer and more confident, but also increases levels of testosterone in your body, which boosts confidence and helps reduce levels of cortisol, the hormone associated with stress. She taught us that in general, you should feel calmer if you stand or walk as much as you can throughout your working day, for example when on the phone. I personally love the idea of walking meetings, in which executives swap the boardroom for the park. How you sit also makes a difference. Try reading this sitting upright, with your shoulders back. You should feel more in control than if you were slumped forward. Finally, just the simple act of smiling can make you feel happier. Try it and see. Discover more tips on living a happier life in WALKING ON SUNSHINE by Rachel Kelly! 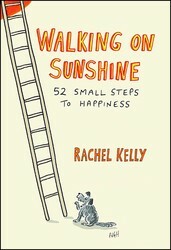 Excerpted from Walking On Sunshine by Rachel Kelly. Copyright © 2017 by author. Used by permission of the publisher. All rights reserved. In the form of weekly journal entries over the course of a year, bestselling author, journalist, and mental health activist Rachel Kelly shares the fifty-two strategies that have helped her cope with depression and anxiety and maintain a calm, happy lifestyle. Walking on Sunshine requires no complicated program or an overhaul of your current way of life. These are simple shortcuts to lighter, more conscious living—tangible rituals you can use to care for your body and mind. In the pages of this engaging book, you’ll find breathing techniques, poetry, prayer, philosophical nuggets, and meditations, all of them gentle suggestions designed to bring more ease and equanimity into your daily life. Written in the candid, conversational style of a good friend and accompanied by delightful cartoon illustrations, Walking on Sunshine is a constant, supportive companion that will see you through your ups and downs.